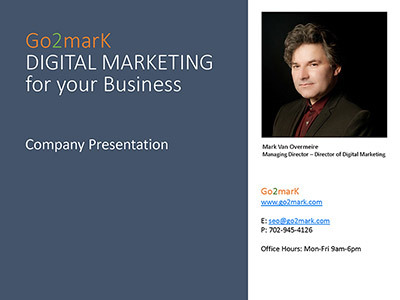 Go2marK is a full online marketing agency. We provide online marketing services such as SEO, SMO, PPC and responsive web design. Below you will find a full overview of the online marketing services Go2marK provides. Our services are tailored to your needs. From B2C and B2B marketing. Big, medium and small business SEO services. Are you looking for search engine optimization specialists? Let Go2marK help you reach your online goals. Do you have an online marketing strategy that works? Online marketing is complex and needs the utmost attention every single day to yield results. Understanding how to reach out to your customers and clients on every platform that is relevant to your business is crucial. With Go2marK your online marketing efforts are measurable. We use goals and key performance indicators at every step of the way. Lead generation is the lifeline of every business. Without it your business is unlikely to prosper and grow. With our B2B marketing service we take lead generation on any level into account. This can be via a form on your website, the phone or a message from a social media platform such as LinkedIn. B2B marketing works great with Pay Per Click programs such as Google Ads & Bing, search engine optimization, and email marketing. Social media proofs to be more challenging because you are targeting businesses, not regular customers. LinkedIn is the best social media advertising platform for B2B marketing.